There Fearleading Werecats were something of a Grail of mine. I found a seller who was having trouble moving them last month, and she agreed to meet me to sell them! My schedule has been insane (thus, the limited updates and no nice new photos), and things with the factory are a bit tense, so I couldn't meet up with her before today. 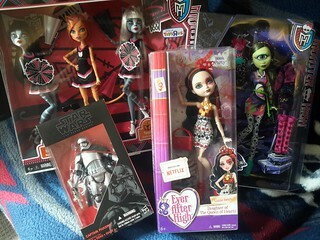 That said, I am thrilled to finally have those ghouls! Now I just need the Ghouls Getaway Meowlody, the GSR Toralei catfish and Cat-tastrophe to get my troublesome trio collection up to date! And after that? I can focus on Catty for a bit.